This is an Action Alert from SCOPE asking you to invest a few minutes and make your voice heard. 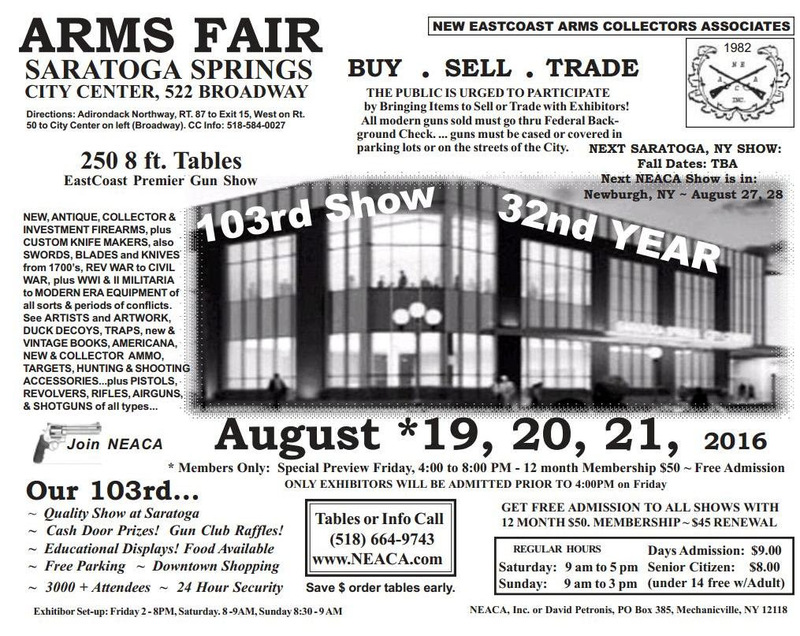 NEACA (New East Coast Arms Collectors Association) has held a gun show in Saratoga Springs every year since 1984. There will be a gun show this year at the Saratoga Springs City Center, 522 Broadway on Saturday, August 20, 9-5 and Sunday, August 21, 9-3. However, this may be the last year this gun show will take place in Saratoga Springs because the City Council has been considering a resolution from the Democratic Committee to ban future gun shows. As of this writing, Dave Petronis, the show’s organizer, is looking for an alternative location for next year. I am writing this to urge any SCOPE members who have the time to attend the gun show this year on Saturday or Sunday (8/20-21) to show that we support keeping it in Saratoga Springs and are opposed to conceding to pressure to move it. If you can attend and can get some of your friends to attend and show how much this show can attract visitors, it might just convince business owners in Saratoga Springs that it is to their advantage to have the gun show remain there. I hope you can find the time to attend.